"They are amazingly reliable and have reduced our downtime and maintenance workload. 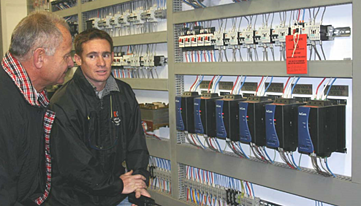 The fans and motors run so smoothly, AuCom is the perfect solution for us" said Jean Guccio, Cape Gate's Electrical Maintenance Manager. Jean worked closely with Pieter Erasmus from CHI Control to replace outdated star-delta starters with modern CSXi soft starters. CSXi soft starters are now used on wire draw machines in Cape Gate's barbed wire line, and on cooling fans on the wire galvanizing line. Conformal coating of the printed circuit boards insures the CSXi is reliable in even the most demanding environments.